For many, facial lines are proud evidence of a life well lived. Others prefer not to wear their age on their skin. At skinFIT MedSpa, we offer dermal fillers, or “liquid facelifts,” to immediately add volume and fullness to your skin. To enhance shallow contours or soften facial shadows, wrinkles, and creases, our nurse injectors use Restylane or Juvederm. For your nasolabial folds, we offer Refine and Define for an instant lift. Wecan also plump up the volume of your lips with Silk and your cheeks with Lyft. Come see us to fill it in and plump it up. As we age, our faces naturally lose subcutaneous fat. The facial skin also stretches a bit, adding to this loss of facial volume. Other factors that affect the facial skin include sun exposure, heredity and lifestyle. Dermal fillers have been called “liquid facelifts” because they offer many of the benefits of a surgical facelift without the downtime. Fillers are a great way to see impressive changes and improvements such as fuller cheeks if you’re not ready for a permanent surgical option. Just remember, you’ll need to have repeat treatments with dermal fillers as a wrinkle treatment to maintain that fresh, plump new look. Although they can’t help with excess sagging skin, these soft tissue fillers can add more volume and provide immediate results at a lower cost than surgery. 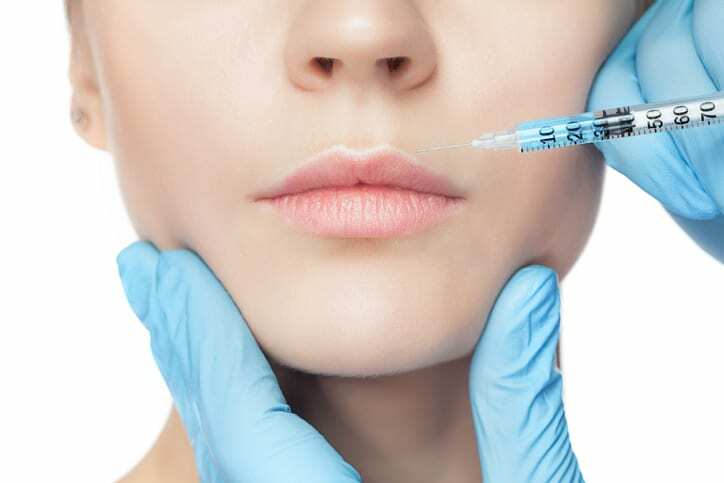 Dermal fillers can be very helpful in those with early signs of aging, or as a value-added part of laser facial rejuvenation treatment. Restylane– Made of hyaluronic acid, Restylane is ideal for smoothing facial lines, wrinkles, and folds. Smile lines, marionette lines, lipstick lines, and laugh lines can all be targeted for correction. Results may last from 6-12 months and touch-up treatments can help maximize the effects. Restylane Lyft- Made of larger hyaluronic acid particles, Restylane Lyft can help correct age-related volume loss in the mid-face and help enhance your cheeks. It also helps create contour and lift and results can last upwards of a year. Restylane Silk- Composed of smaller, smoother hyaluronic acid particles than those used in other Restylane products, this is the first dermal filler approved by the U.S. Food and Drug Administration (FDA) for lip enhancement and the treatment of wrinkles and lines around the mouth. Results easily last 6-12 months, with touch-ups allowing you to maintain your results year-round. Restylane Refyne/Defyne- Two of the newest products to receive FDA approval for the treatment of nasolabial folds (NLF) or laugh lines. Restyle Refyne was approved for the treatment of moderate to severe facial wrinkles and folds and Restylane Defyne for the treatment of moderate to severe, deep facial wrinkles and folds. These scientifically advanced gels offer a greater range of flexibility and support, making them ideal for natural looking results.